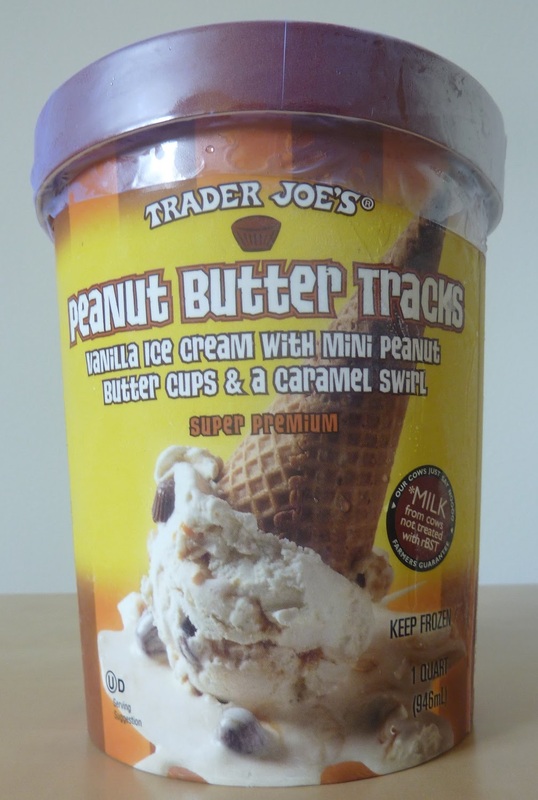 This ice cream isn't bad, but it feels like Trader Joe is trying to imitate Ben & Jerry with this one. Dairy Free Mochi is unique and Trader Joe-esque. Stuff like Pilgrim Joe's Pumpkin Ice Cream is simple enough to avoid comparison with Ben & Jerry. And, of course, the Lemon and Triple Ginger Snap Ice Cream is by far the best example of what we've seen Trader Joe's do with ice cream. It isn't particularly simple, but it somehow gives off an air of delicateness. And, while somewhat indulgent, it's more of a dessert you'd expect to find at the end of a five course meal in a fine-dining establishment, as opposed to something a gluttonous fat man would scarf down in between the tilt-a-whirl and the tractor pulls at the East Bumblehump County Fair. This product, however, is a shade closer to the latter. Fortunately for this item's score, I'm no slender sophisticate, and I've enjoyed the aggravated roar of a souped up Massey Ferguson or two in my day. But I do have to say, despite its terrible name, I prefer Chubby Hubby to these Peanut Butter Tracks any day of the week. I guess the name is a play on "moose tracks." Moose tracks has little peanut butter cups in vanilla ice cream, and that's exactly what this is. I suppose the peanut butter cups are intended to resemble muddy footprints of the large woodland mammals in a blanket of white-ish snow. There's also supposed to be swirls of caramel. Sonia and I both agreed that TJ's skimped on the caramel. But to me, that was of little concern. I did enjoy the copious quantities of little peanut butter cups, and the vanilla wasn't bad...but it wasn't stellar either. My biggest complaint is just that the whole thing didn't blend together as perfectly as Ben & Jerry's stuff. There's just something so ingenious about their flavors. 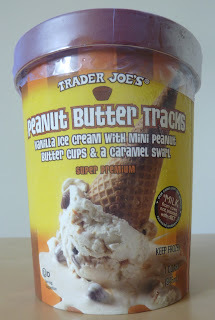 Somehow Trader Joe captured that kind of cohesiveness with his Lemon Triple Ginger Snap ice cream, but not with this. This really isn't even as good as other brands of moose tracks that I've tried. But again, it's cold, it's sweet, and there's enough peanut butter in it to make it somewhat rich and filling. Sonia says it's worthy of a 3.5. I think 3 stars is generous enough. I have not seen this one at my TJ's but I did come across some soy ice cream sandwiches and boy were they terrible. I actually ended up giving them away. They tasted like raw flour and the texture was strange. You should do a review of those and let me know what u think. Hmm, yeah we'll have to check it out and see what it tastes like. Have you tried their Coconut Milk Ice Cream? I have to agree with you on this one. It's kind of a "bite" on Ben & Jerry's and fails miserably. I guess I'll be the fatty here and just come out and say it: there just AIN'T enough peanut buttery-cup goodness in this to balance out the ice cream to goodie ratio. Yep we couldn't agree more. I had no idea that TJ's made coconut milk ice cream, I will have to see if I can find it. I absolutely agree! I was very disappointed in this ice cream. I realized that I had to add peanut butter to make it better...then double realized it's a peanut butter ice cream!! Don't recommend...Ben & Jerry's is way better.